We took our second day trip on Malta from our resort in Golden Bay to the capital of the island, Valletta. Valletta was established in the 1500s and today the historical city has a population of only about 6,000, but the metropolitan area is closer to 400,000. Valletta is the southernmost capital of Europe, and in 1980 it was recognized as a UNESCO World Heritage Site. We began our time in the city with a 90-minute walking tour with Colour My Travel that began near the new Parliament building and ended in St. George's Square. It was a good tour, but definitely not the most engaging or interesting one we’ve been on. We saw the ruins of the Royal Opera House (it was destroyed by a bomb in World War II), the Upper Barrakka Gardens, the Castellania (the law courts of the Knights of St. John), St. John's Co-Cathedral, and Republique Street, to name a few. After the tour we headed back to the Upper Barrakka Gardens to eat lunch overlooking the harbor and enjoy the gorgeous day. We also timed our visit at the gardens so that we would be there for the 12pm firing of the cannons at the Saluting Battery, which is located between the gardens and the harbor. I was able to squeeze in between the crowds and get a great view of the action, and I think we were both a little startled by how LOUD the cannon was! Under the Upper Barrakka Gardens is the Lascaris War Rooms. We arrived just a few minutes after a tour had started (the only way to go through the war rooms is via guided tour), so we decided to wait for the next one. We watched a few newsreels with footage of Malta during World War II in the theater room while we waited, and then began our tour with one of the guides and a few other folks. 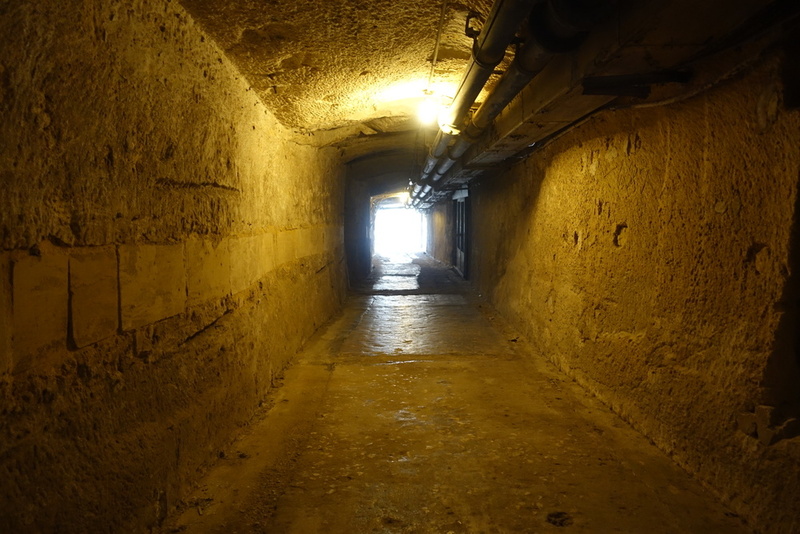 We really enjoyed learning about wartime Malta through the underground tunnels and rooms that made up the operations base in Malta during World War II. Because of Malta's important location in the Mediterranean, the Allies used it as a base to attack North Africa and as a launching point for the invasion of Italy. The Lascaris War Rooms was where the Allies, including General Eisenhower and his commanders, directed the invasion of Sicily in 1943. Malta was also difficult to defend, and was subject to intense bombing during the war. In fact, it holds the record for the heaviest, sustained bombing: 154 days and nights and 6,700 tons of bombs. We spent about two hours in the war rooms, and when we were done, we walked around a bit, checked out the Tourist Information center nearby and got some ideas for the rest of our time in Malta, and decided to head back to our resort. We had a nice, not-too-busy day in Valletta. We learned a lot about Malta, and if it weren’t for the bus system, it wouldn’t have really been a full day away either. We left around 9am in order to make it to Valletta in time for the walking tour, and didn’t get home till dinner time because our bus broke down in the middle of the road on the way back to the resort. Most people that go to Malta spend a least a little bit of time in Valletta (it's the closest city to the airport), and I’d highly recommend the Upper Barrakka Gardens, and if you’re interested in World War II, taking a tour of the Lascaris War Rooms. If you’re anything like us (which would be that we thought we knew a fair amount about the war, but apparently not that much since we had no idea about Malta’s involvement and that General Eisenhower and U.S. troops spent time on Malta during World War II), you’ll likely find the information surrounding the rooms quite interesting and perhaps it will even give you a new understanding of World War II and the battles fought in the Mediterranean. We had really wanted to tour St. John's Co-Cathedral, but on Saturdays it's only open from 9:30am - 12:30pm, and our walking tour lasted from 10am - 11:30am and we went to the gardens afterwards for lunch and the firing of the cannons, so we missed out. Had we been more cognizant of the times, we would have gone to the cathedral immediately, but alas. I suppose now we have something to see if we ever return! I hear St. John's is really spectacular, though, so my top three suggestions for Valletta would be the cathedral, the Upper Barrakka Gardens, and the Lascaris War Rooms.